A great camping and hiking spot has several features. It should have a place to camp and maybe cabins or other accommodation. They should also have a range of hikes you can go on. It is even better if there are some other activities you can do. This list is for anyone in South East Queensland looking for a great place to camp for a few days with lots of hikes and other activities. There are many great campgrounds in South East Queensland but few places that really meet the criteria of a great camping and hiking location. Here are my 5 favourites. Probably the number 1 place to camp with lots of hikes and more is O'Reilly's. The official name is Lamington National Park, Green Mountains Section, but everyone calls it O'Reilly's after O'Reilly's Rainforest Retreat. 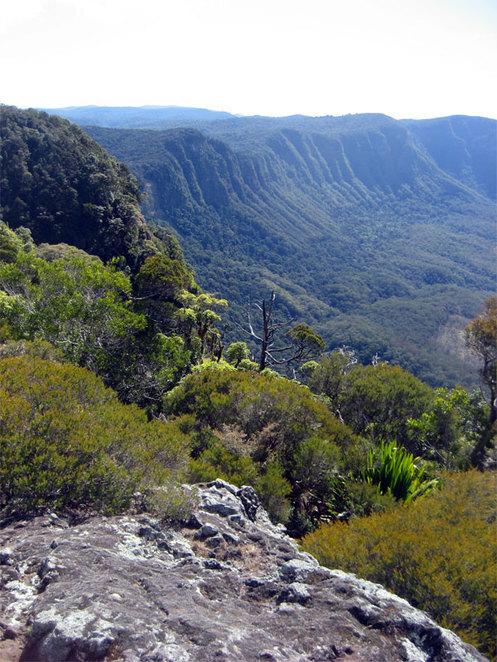 Note: Lamington National Park has two main sections, which are Binna Burra and Green Mountains. Both are worth visiting, though don't get them confused. O'Reilly's has a very nice Department of National Parks run campground which includes toilets and showers. You can also dine at O'Reilly's Mountain Cafe and Rainforest Retreat. There are no barbecues, so you will have to bring your own gas barbecue to cook. 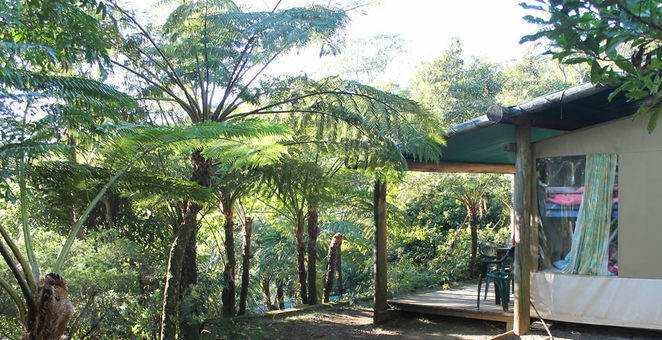 Of course if camping is not your thing, then you can stay at the Rainforest Retreat. You are looking at around $200 a night for a mountain view room. There are heaps of walks in the area. You can do the boardwalk and then go on the free (gold coin donation please) Tree Top Walk. 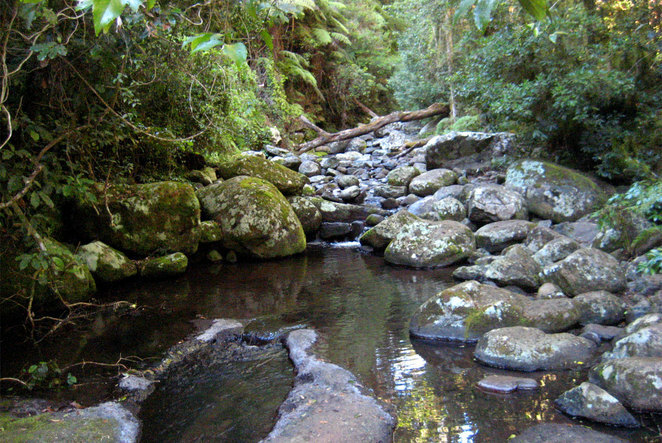 You can also stroll 3.1 km Python Rock Track or the 4.4 kms Moran Falls Track. Both of which lead to lookouts. For anyone looking to do more serious hikes, then you have the Box Forest Circuit. It is only 10.9 km but it takes about 5 hours because you will want to stop at all of the many scenic falls and cascades you pass by. That of course doesn't include stops for swimming. This is also one of the busiest tracks at O'Reilly's. If you want to go on a longer hike, then you can do the 17.4 km Tooloona Creek Circuit. For about half the track you are walking over rocks, which does slow you down and can be slippery if it is raining. But it is still well worth the effort. Another great long hike is the Albert Creek Circuit. At 22 kms this hike has it all. It follows the creek part of the way, you visit a couple of lovely falls, has great views at Echo Point and then the return via the flat border track. There is more to O'Reilly's than just hiking and camping. There are also lots of tourist attractions and activities. 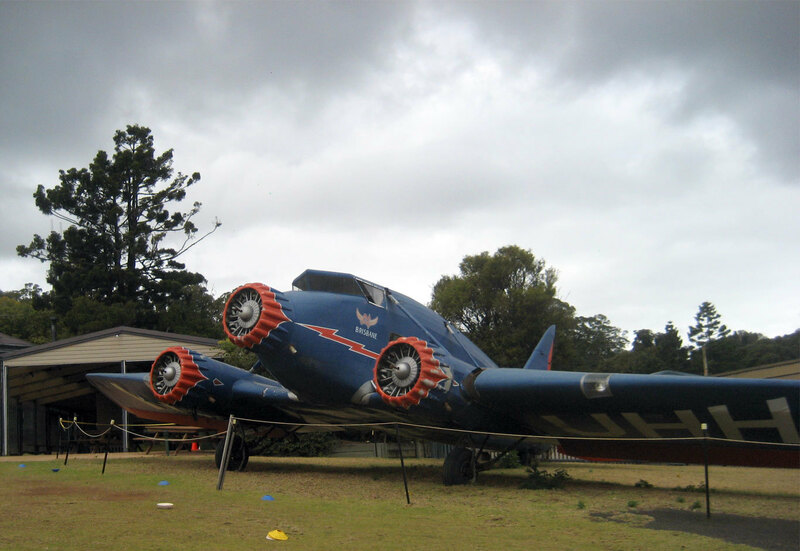 There is the Stinson Plane Replica (part of the O'Reilly's Legend), a bird zoo, as well as Segway, 4WD and walking tours that you can join. 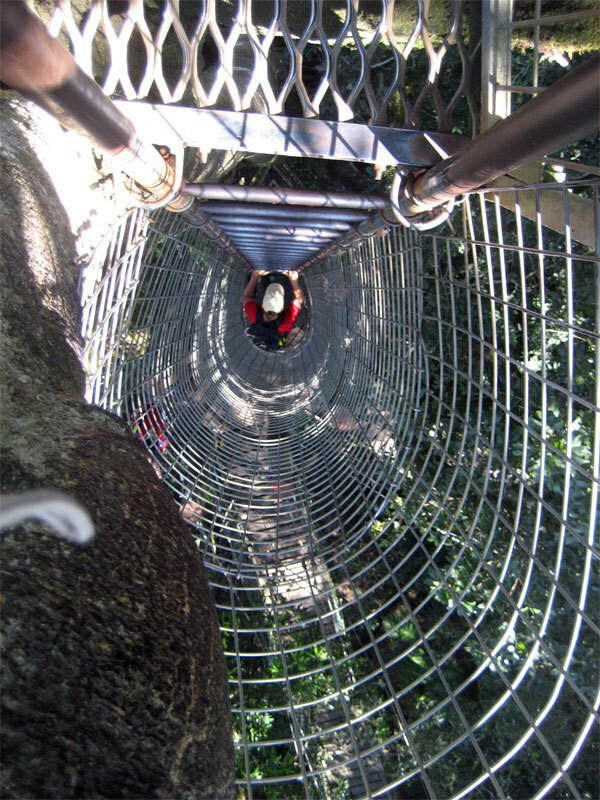 There is also a flying fox for people who want the experience of zipping over the rainforest rather than walking through it. The main draw back is the area sees lots of tourist buses coming up the mountain, which makes the main area a little busy and the shorter walks busy too. However if you hike early in the morning or go on the longer walks, you will see few people. 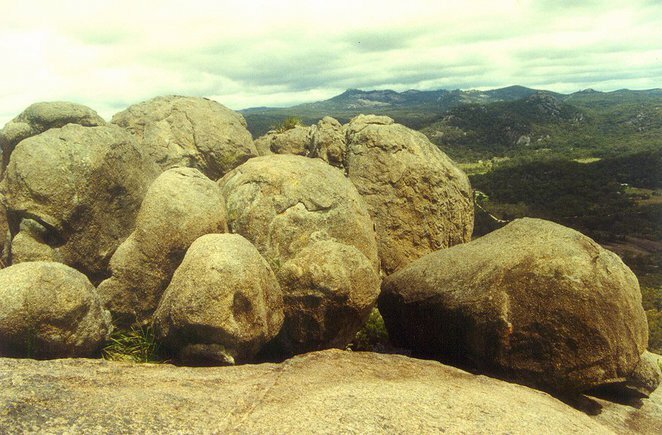 Girraween is one of the best hiking and camping area in South East Queensland and features numerous balancing rock formations and the exposed pyramid which hikers easily scramble up. As it takes around 3 hours to drive here, it is just a little too far to visit on a day trip, but close enough to go away for just a weekend. There are two camping areas, Bald Rock Creek (not to be confused with Bald Rock National Park on the other side of the border in NSW) and Castle Rock. Both have hot showers, flushing toilets, picnic tables and fireplaces. I prefer Bald Rock Creek Camping Area for its proximity to Bald Rock Creek which normally has enough water in to find a nice little pool to swim in. However both camping area are close to each other and provide a similar level of access to hiking paths. 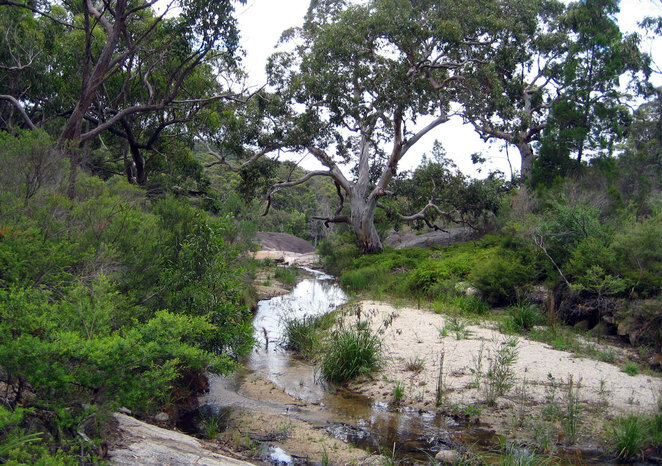 There are a number of short walks in Giraween, such as to Granite Arch or around Bald Rock Creek. Of course most people will want to scale The Pyramid. This walk is only 3.7 kms and might take you an hour to make it up to the top of the Pyramid. Then of course there is 5.3 km return walk to The Junction known for its swimming hole. The southern walking tracks are a bit longer. The most iconic walk is to the rock formations known as The Sphinx and Turtle Rock. As a side journey on this walk you can also ascend Castle Rock which is a granite outcropping on top of a hill. A nice long hike is the 11 km return walk up Mt Norman, though you can also drive to the Mt Norman Day Use area where it is only a 4 km return walk up Mt Norman. 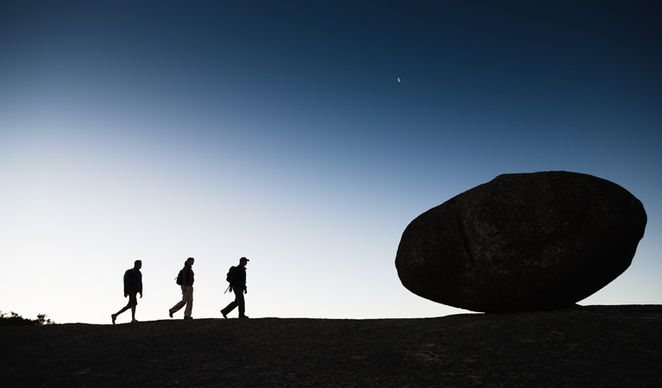 Girraween has several days worth of walks, many with amazing rock formations as well as fantastic views. There is also various swimming holes in the area. Girraween is half-way between Stanthorpe and Tenterfield if feel you need to pop into town for shopping, a meal or some entertainment. 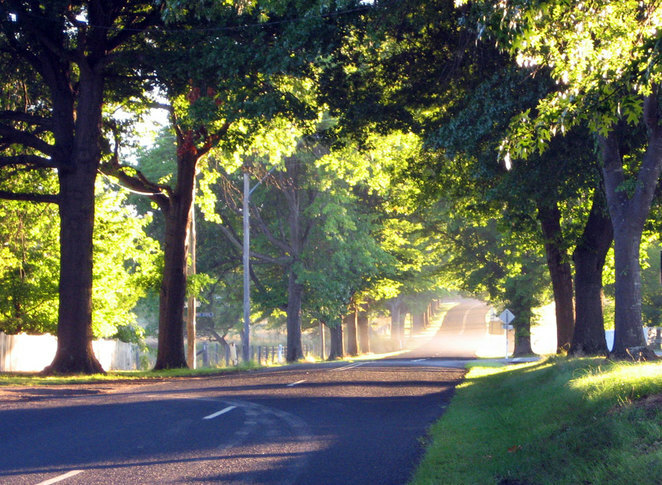 Tenterfield is the more lively location, especially on weekends. Check out the Commercial Boutique Hotel for live music in the front bar and great dining in the lounge. I put these two together because they are right next to each other only separated by Mount Lindesay Road. Boonoo Boonoo has a better campground and swimming spots while Bald Rock has better hiking, You can of course camp and hike at both locations. First of all, Boonoo Boonoo has a great campground. There is plenty of shade with toilets and barbecues. The campground is right next to the river where there are a number of little swimming holes. 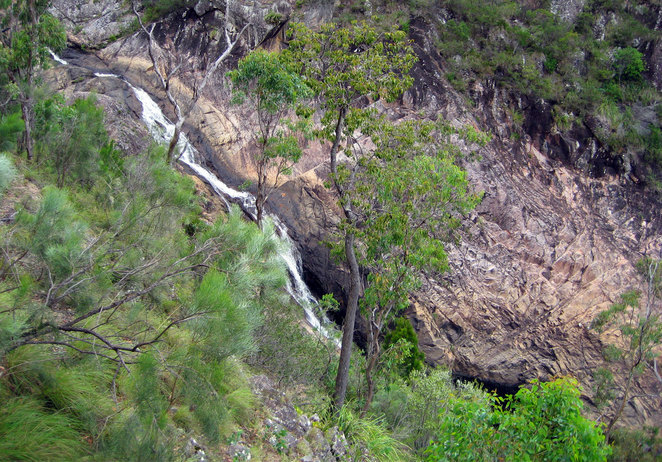 The highlight of Boonoo Boonoo is Boonoo Boonoo Falls and the rock pools above the falls. This set of swimming holes is quite large, has cliffs for jumping off and little rock pools with falls you can sit in for a natural spa. When it comes to hiking, the hike to do in the area is Bald Rock. This walk takes about 40 minutes going up the easy way. You can also go straight the rock face, but most people elect to take the walking track that goes through the bushland around the back of the rock. 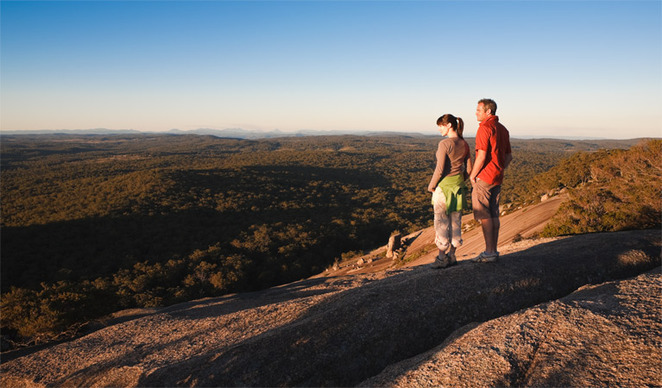 Bald Rock is Australia's largest granite monolith with great views from the top. 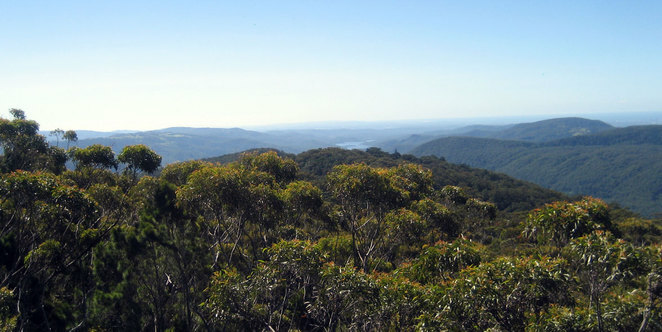 The other worthwhile walk at Bald Rock National Park is Little Bald Rock. This is 14 kms return and passes by a number of standing rocks as well as through a rock gate. Boonoo Boonoo also has a hike, which is the 14 km river walk that follows the fire trails by the river and goes up to the Boonoo Boonoo Falls. You are also not far away from 2 towns, Stanthorpe in Queensland and Tenterfield in New South Wales. Of the two, Tenterfield is more lively with the great newly refurbished Commercial Boutique Hotel offering great dining as well as entertainment on weekends. It is the combination of both Boonoo Boonoo and Bald Rock, across the road from each other, that makes this an ideal long weekend get away. 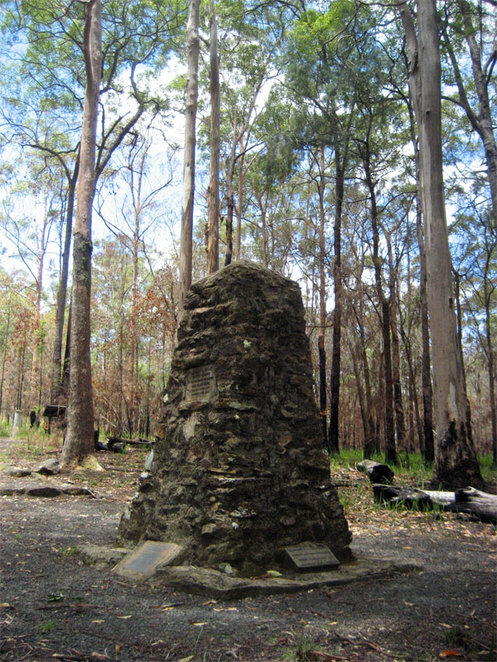 The other section of Lamington National Park is Binna Burra. This location has a privately run campsite, rooms, cabins and a mountain cafe and restaurant. There are also a wide range of hikes here as well. 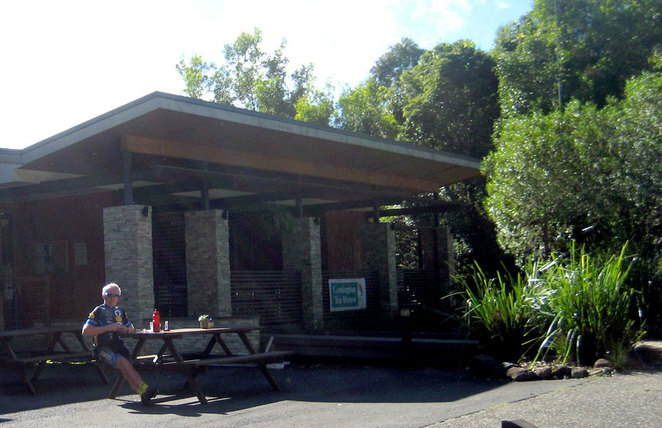 For short hikes you can do the 2 km return walk to the Bellbird Lookout, though one of the most interesting walks is the 5 km Caves Circuit. There is also the 5 km Tullawallal Circuit that follows the stream. 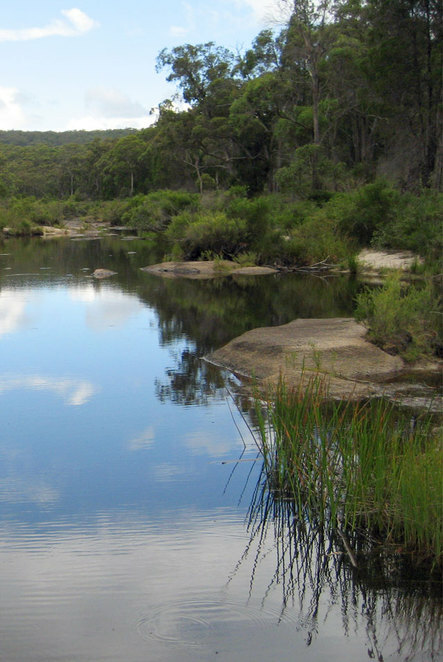 One of my favourite shorter walks is the Gwongoorool Track that takes you down to the Gwongoorool Pool. This is one of the best swimming holes in South East Queensland, though being a mountain stream it can be cold even in summer. If you are looking for a more serious hike, then one of the most interesting is Daves Creek Circuit. 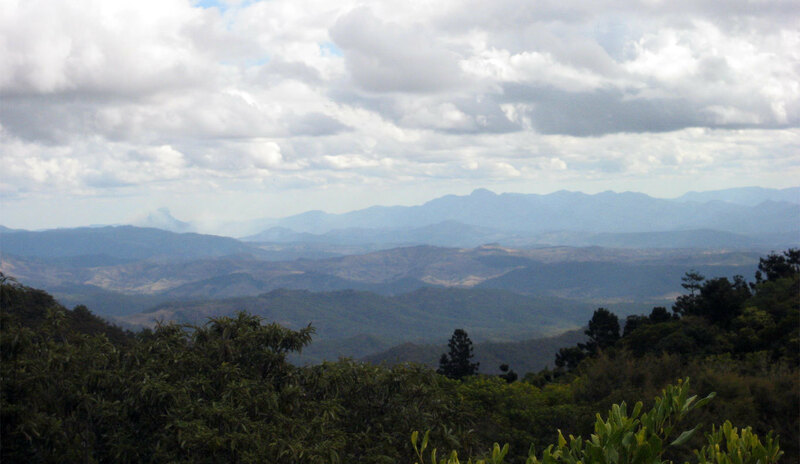 This passes through very varied terrain and there are features such as caves, lookouts, waterfalls and the highlight is the optional scramble up Surprise Rock, which is the ideal place to enjoy the view while eating lunch. This is not the only hike of a similar length. There is also the Lower Ballunjui Falls hike that goes down hill to the base of a lovely falls. Then of course you have to walk back up, which is not too hard, but it is usually nicer to be walking downhill at the end of a hike. 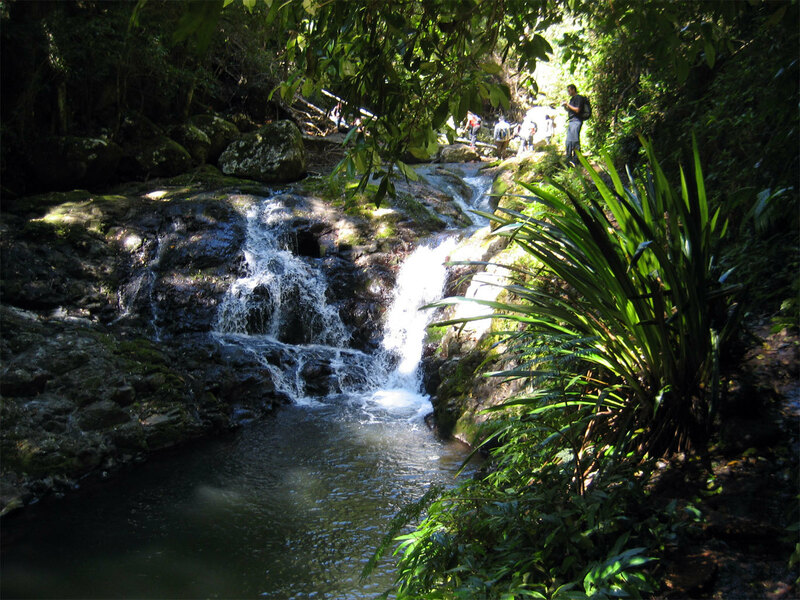 For longer hikes there is the 17 km Coomera Circuit which passes by many waterfalls followed by views from the Border Track when you return. 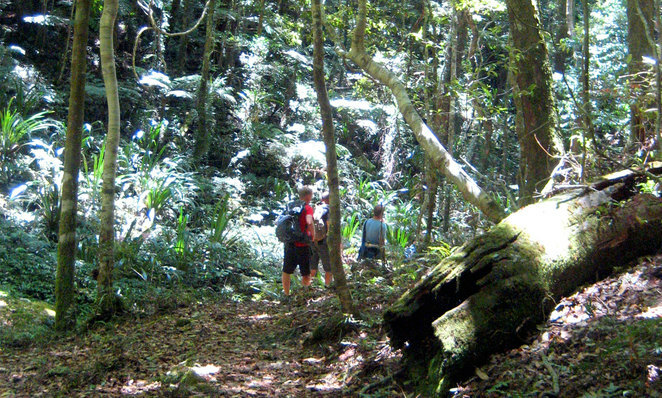 The 21 km Ships Stern Circuit is a popular walk for fitter hikers. Overall one of the great hiking locations in South East Queensland. 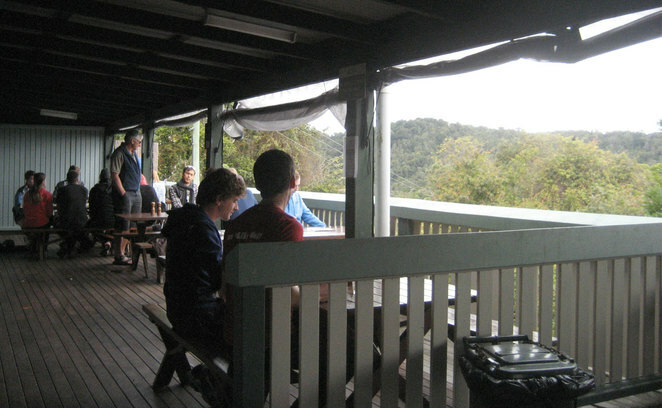 Like O'Reilly's there are also other activities as well such as yoga at the Binna Burra Lodge as well as abseiling, flying foxes and archery. While it doesn't quite fit the exact criteria for camping near lots of walks there is a lot to be said for theMain Range National Park. There are two camp sites, one at Spicers gap and the other at Goomburra. Both of these camp sites have a hike leaving directly from the campsite, but to go on additional hikes you need to drive a short distance. The Goomburra campground is better than the one at Spicers Gap. Gomburra has a large grassy area near the creek. There are barbecues and tap water. 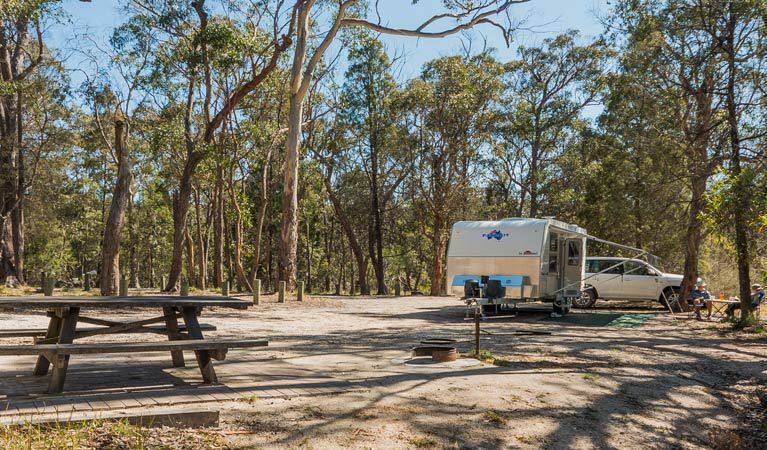 The campground at spicers gap is more basic but suitable as a place to stay overnight if you want to get up early the next day and go hiking. 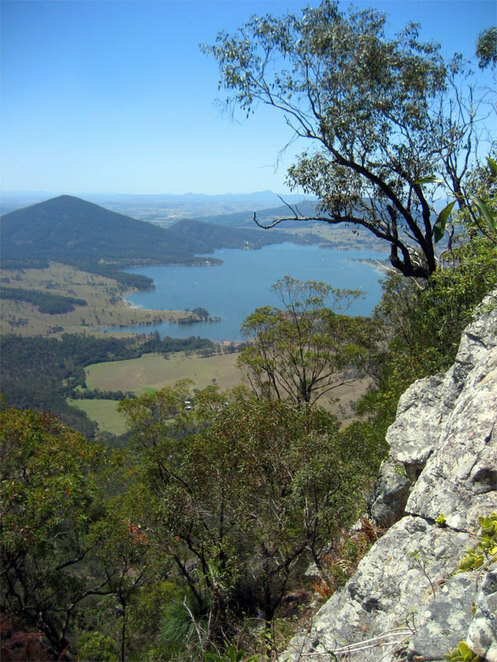 From Gomburra you can walk the 6.5 km Cascades Circuit and take a diversion up the ridge track which will add another kilometer or two to the walk. There are other walks worth doing in the area but you will need to drive a short distance up the Lookout road to reach them. 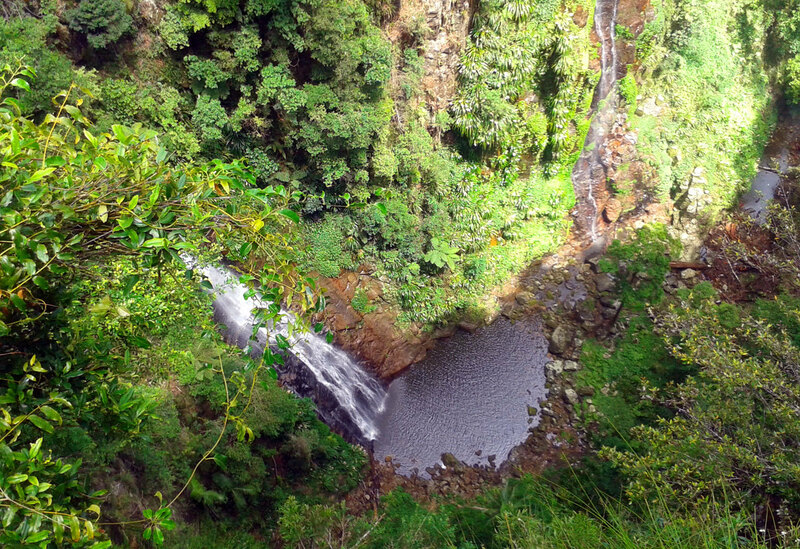 The 3.6 km Araucaria Falls Walk is a nice rainforest walk leading to a falls and the 12 km return Winder Track is a pleasant walk with beautiful views that leads to some abandoned logging equipment. Spicers gap has several walking trails that when linked together form the Mt Matheison Trail (though officially the walk is not a circuit, but the end of the walk follows the unsealed Spicers Gap Road where you are unlikely to encounter any cars. This lovely walk passes through varied vegetation with great views. The walk includes a stone lined road, an old well and an old bullock cart from the logging days. The really interesting walks are at Cunninghams Gap about 26 kms from Gomburra. There are two main tracks to choose from. Mt Mitchell is a lovely 10 km walk with great views from the top. Though the main pay off of this walk are the views as the walk itself is nothing special. 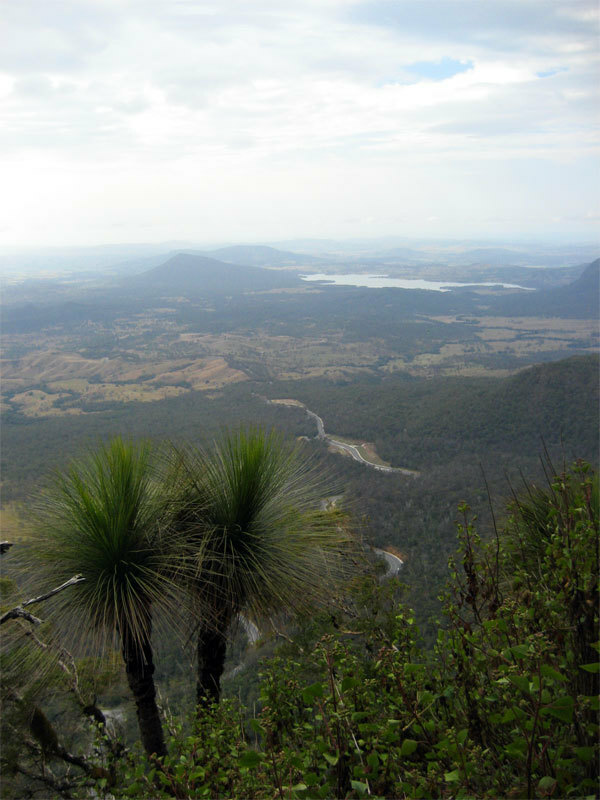 The other track takes the Rainforest Circuit to Fassifern Valley Lookout, then heads up the mountain to the lookout at Mt Cordeaux, followed by a fairly flat walk up to iconic views from Bare Rock. Overall you have several days of walks in the area but you do have to drive a short distance between them. An alternative place to camp is at Lake Moogerah. 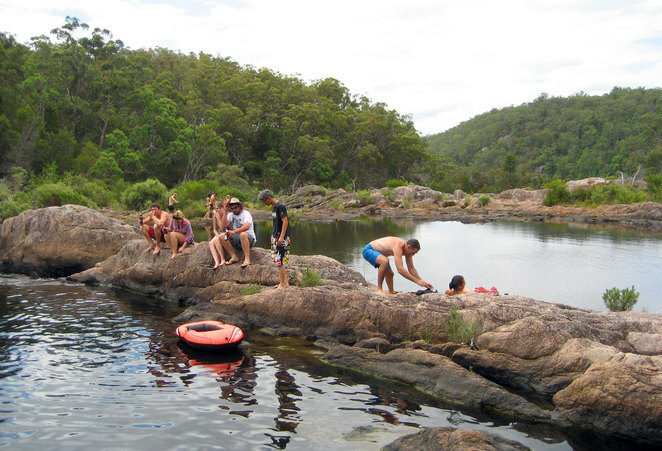 Here you have swimming and water sports in the lake, you can hike the Moogerah Peaks and then drive up to the hikes at Cunninghams Gap, Spicers Gap and Goomburra. I love O'Reilly's. The tree top walk is lots of fun. I'm glad there weren't many people when we were there. It would take away from the 'getting away from it all' aspect of bushwalking if all you got away to was crowds.